After declaring inflation all but gone last summer, investors are now deciding that calling the time-of-death might have been a bit premature. Starting in September and accelerating post-election, 10-year inflation expectations, measured by 10-year Treasury Inflation Protected Securities (TIPS), are surging. Breakeven levels (the difference between a yield of a nominal bond and an inflation-linked bond) are up over 40 basis points (bps, or 0.40%) from the summer low and over 80 bps from the February nadir. Last October, I suggested that inflation expectations were too low. Despite the recent rally, here are four reasons why I think the rebound in inflation and inflation expectations is likely to continue into 2017. 1. The recent rebound simply represents a reversion to the mean. While breakevens have moved dramatically, they’ve only reverted to the post-crisis average; 10-year breakevens remain 20-30 bps below where they were in the early summer of 2014. Investors are still not expecting any real pickup in inflation beyond the post-crisis norm. 2. Core inflationary pressures continue to build. Two of the key components of core inflation, medical costs and housing, are accelerating. Consumer Price Index (CPI) Medical Care is now running at 4.25%, roughly double the level from two years ago. The rise in medical costs appears to be a function of a structural change in deductibles and out-of-pocket expenses. Housing costs also continue to rise. Owners Equivalent Rent (OER) is now running at roughly 3.4% year-over-year, the highest since spring of 2007. 3. Prices on cyclical commodities are spiking. While oil prices have grabbed the headlines, industrial metal prices are also surging. The magnitude of the increase is almost certainly exaggerated by speculation and a growing preference in China for dollar denominated assets. That said, the change was already underway pre-election. The JOC Industrial Commodity Price Index is up 40% year-over-year. 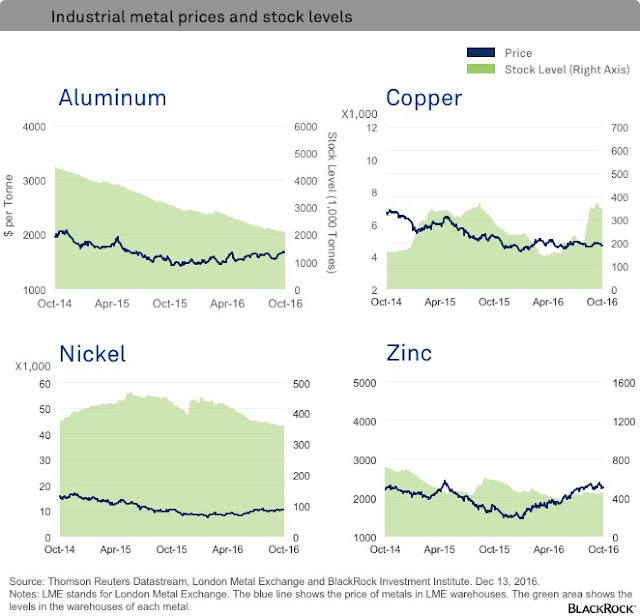 See the chart below for individual metal prices. Historically, there has been a tight correlation between industrial metals and 10-year breakevens, a relationship that has been consistent even in the post-crisis environment. 4. Most post-election factors point to more inflation. While the market has undergone a significant recalibration post-election, most of the adjustment simply reverses the decline that began in June of 2015 and culminated last February. In this context, the full impact of the election may not be fully discounted. I see significant potential for fiscal stimulus and potentially trade and immigration disruptions, both of which would add to existing inflationary pressures. Rising rates have hurt the entire bond complex, since a significant portion of the recent rise has been driven by inflation expectations. Still, TIPS have been outperforming nominal Treasuries and because rising inflation has probably not been fully discounted, this pattern may have further to run. As such, I continue to prefer TIPS to the rest of the Treasury market. Courtesy of Russ Koesterich, CFA, is Head of Asset Allocation for BlackRock’s Global Allocation team and is a regular contributor to The BlackRock Blog.